Before you can harvest honey from your Top Bar hive, you must determine whether your colony made excess honey and where it is in the hive. A Top Bar hive has honey stored in bands above the brood area on each comb. That honey is not part of the harvest and should be left for the bees’ winter stores. The honey you can harvest comes from those combs completely filled with honey and capped. Remember that these same capped honey stores can also be critical for the survival of the colony in winter. You must approach the harvest in a conservative way, always leaving enough to see the bees through the winter months. The pure honeycombs are likely to be found farthest from the entrance. In the case of a front-entrance colony, that would be toward the back. You may notice that some of the honeycombs are capped on top, but the bottom still has some open cells. Those cells will have a higher moisture content and are not suitable to be included in the harvest. If a significant amount of your comb is uncapped, your honey is not ready and should be left in the colony until it’s capped. If just a few rows at the bottom of a comb are not capped, you can harvest those combs and discard the uncapped cells or, better yet, eat them on the spot. Since combs filled with honey are heavy, the bees will build extra bracing to the sidewall. This will be most apparent near the top just below the bar. This brace comb must be carefully detached before the comb is removed. As soon as you begin removing the brace comb, some honey will be released and bees will begin to lap it up. This is where planning and expedience come into play. Move quickly through the process and have a plan to cover the harvested combs immediately. You don’t want to set off a robbing frenzy. Once you have identified what honeycombs you will take, the issue of handling the removed combs comes next. Top Bar combs filled with honey are very heavy and very fragile. The comb can break off the bar when mishandled. It is not recommended that you harvest on very hot days because the likelihood of breakage increases with higher temperatures. Build some kind of covered box or container that will allow you to transport the comb in a protected way to head off a robbing frenzy. This box makes it easy to protect and transport comb. The only way to remove bees from a Top Bar hive comb is to use a bee brush. Beekeepers use many objects for this purpose, including goose or turkey feathers, draftsmen’s brushes, and the commercial brushes sold by bee supply houses. The best brushes can be rinsed off with water when they get sticky with honey. Do bees like being brushed off comb? In a word, no. So it helps both you and the bees to brush them off using small, quick strokes with just enough force to remove the bees without damage to the bees or the comb. You want to direct them back into the hive body. The action can be thought of as a series of flicks as you work your way across the comb. Both sides of the comb will have bees that need removing; remove the bees on the side facing you first and then lower the comb so you can reach over the back and remove the bees on the back. This technique is much easier than trying to turn the heavy comb with one hand. If you have just a few combs to harvest, your best option is to crush and strain them. Select a clean area and never harvest outside or any place that will allow the bees to find you. Line a strainer or colander with a paint strainer and place it over a clean bucket or a deep bowl. The process is simple but decidedly messy. Slice or break a small section of comb off the top bar and squeeze it to release the honey. Use a clean pair of kitchen gloves to keep your hands from getting sticky. Keep squeezing until all the honey is out. At this point the comb will harden into a ball. Break the ball apart and leave it in the strainer. Continue until all your combs are crushed. Leave them to strain until no honey is dripping through the paint strainer. Once all your honey is strained, it’s ready for you to jar or enjoy. Regardless of whether you use the crush-and-strain method or a honey press to extract your honey, the comb is destroyed and the bees will have to build new comb before they can store more honey. That’s both a disadvantage and an advantage of Top Bar honey harvesting. The disadvantage is the time and resources that the bees have to expend to draw more comb. The advantage is that you will have fresh, new comb that ensures the purity of your honey products (pesticide buildup can occur on old comb used year after year, as can happen when spinning frames and extracting honey). Using this simple method, your honey will contain all the goodness the bees put into the honey, including small amounts of pollen and small bits of wax. These tiny particles are suspended in the strained honey but eventually will rise to the top of the container you use. It will look like the honey has a white, foamy coating. It is perfectly healthy for you to enjoy — or it can be removed with a spoon before eating. Eventually all honey will crystalize. That does not change the purity of the product in any way. If you prefer liquid honey, you can heat the crystalized honey in a warm water bath (120 degrees [49 degrees Celsius]) until it liquefies. Never heat honey excessively. One by one, slice the comb off each top bar using a serrated bread knife or an electric uncapping knife. Allow the entire comb (wax and capped honey) to drop into the honey press’s container. Depending upon the size and style of your press, you are likely to get several entire combs into the hopper. 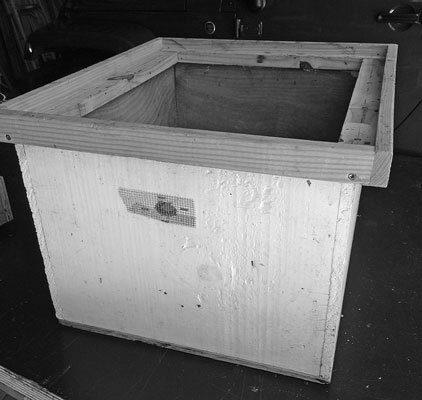 When the hopper is filled, put the lid and screw mechanism in place. Following the manufacturer’s instructions (each brand is slightly different), apply pressure (using the screw mechanism) to squeeze and crush the honey from the wax combs. 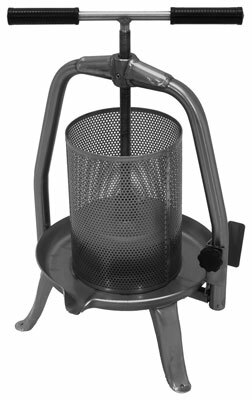 The extracted honey will ooze through the metal or cloth filter, and you can capture it in a clean honey bucket. This is one style of honey press that is used for extracting honey from Top Bar hives. Remove the crushed wax, clean the filter, and repeat the process until all the combs have been processed. This method for harvesting honey also harvests a lot of beeswax, so be sure to save and process the crushed wax. Return the now-empty top bars to their hive. The bees will need to rebuild new comb on these bars before they use them again next season. Honey presses are not that easy to find, and they can be expensive. You are more likely to find honey presses from suppliers in Europe, where they are more commonly used. But if you are clever at building things, the Internet will turn up an array of plans for making your own. Cut-comb honey is usually selected from your best-looking comb and never from old or brood comb. With cut-comb you simply cut sections of comb and use them as is. Some folks spread the wax and honey right on the morning toast and others chew small sections like candy. You can store your cut-comb section in plastic containers. Freeze the cut comb in containers for 48 hours to kill any wax moth eggs.